wear a band around one's head 頭にバンドを巻きつける. a band of light 一条の光. a band of thieves [demonstrators] 盗賊団[デモ隊]. [band oneself で] 団結する 《★しばしば受身で用い，「団結している」の意になる》. They were banded together. 彼らは団結していた. [band oneself で] 〔…に対して〕団結する (cf. 1b ★). We banded ourselves together against drug pushers. 我々は麻薬密売人に対して団結した. She held her hair in place with a velvet band. She always ties her hair back in a band. She's a singer with a band. The interval between status thresholds that define a specific level of performance. All input values between the upper and lower thresholds or boundaries of a band have the same indicator status and performance level. A container for label and control pairs and for complex controls such as grids. From Middle English band (also bond), from 古期英語 beand, bænd, bend (“bond, chain, fetter, band, ribbon, ornament, chaplet, crown”), from Proto-Germanic *bandą, *bandiz (“band, fetter”), from Proto-Indo-European *bʰendʰ- (“to tie, bind”). Middle English band reinforced by Old French bande. 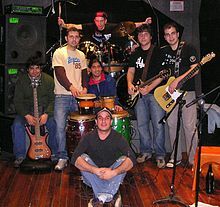 Cognate with Dutch band, German Band, Danish bånd, Swedish band, Icelandic bandur (“band”). Related to bond, bind, bend. (especially 米国用法) A ring, such as a wedding ring (wedding band), or a ring put on a bird's leg to identify it. From * (“wildcard”) + band, after the roguelike Angband, after the fictional fortress of Angband in J. R. R. Tolkien’s Silmarillion. (uncountable) A subgenre of roguelikes, characterised by non-rushed gameplay, levels not being saved upon being left, large numbers of items and a steep power curve. A game of this genre.